Jesmonite is an adaptable product that is suitable for both internal and external work. Its unique properties give the product an advantage as it is considered durable, light weight, flame resistant and resistant to impact. It can be used to fabricate both small and large work. 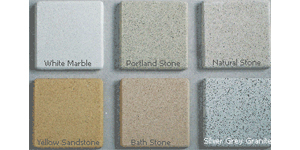 Finishes can resemble plaster, stones and metals, please see examples below.